One of my greatest achievements in life happens every day. I get up and go to work. The alarm goes off at 5:20 a.m. I turn on the light right away so I don’t fall back asleep, and I listen to the BBC roudup and review, then we go straight in to local news on CBC. But I usually get up right away, get the water going for coffee, eat a bowl of cereal, then get back in bed right away again to enjoy my coffee beside the radio. After the 6 o’clock national news, it’s time to get going. Just before I spring up to meet the day, I often flip through a magazine or a book, a last little indulgence before another big day at the warehouse. After all this springing about, showering, putting the finishing touches on lunch (this morning I had yogurt with pomegranate seeds, a peanut butter and homemade bread sandwich, two bananas, a grapefruit, and a tupperware full of nacho chips). Without a good big nutritious lunch, I am useless at work, my stomach and head feel numb as I drag boxes around, fill bags with tea, or label canisters. Getting out of the house on time is a feat in itself. I have to check on two cats, make sure they’re not somewhere wierd, feed and water them, and check their litter box. Hats, gloves, scarves, coats, umbrellas, and bags all have to be checked and assembled; lights have to be turned off, heat turned down, and bed made. I have to be out the door by 6:30 or I’ll be running late. It is a ten minute walk to the Cremazie metro. 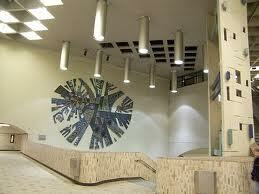 I take Cremazie because it is one stop north of Jarry, and so it is easier to get a seat. If I get a seat, I get to sit the whole way around to Namur, about a 40 minute ride. I’m on my feet all day, I don’t like standing on the metro. Cremazie has a beautiful snowflake sculpture on its wall, a huge creation probably thirty feet long, with words and pictures worked into it. I don’t look at it much in the morning, as I bolt up to the head of the train as fast as I can, take a seat and prepare my ipod and book. Getting the right music going, and ensconsed into a book makes the ride even better, providing a buffer around, an artificial sense of space. But it works. I don’t like crowds or crowded places, a thing I’ve learned about myself since moving to the city. We rip around the city, twenty some stops in all. It fills up and empties out three or four times at the major hubs: Jean Talon, Beri-Uqam, Lionel Groulx, and Snowdon. Square Victoria is usually packed too. People watching is a good distraction. I check to see how many watchers are on the train, how many readers, sleepers, gonzo looking people, and well dressed folk there are on the car. I take mental notes (when I’m not reading). It’s a long ride around. Namur finally comes, it is now 7:15 a.m. There’s a big hike up out of the metro, then a kilometre or so down to the warehouse. By the time I get there, put my stuff away, and settle in for a rest, I am exhausted and hungry again. So I pull out the bananas, and chat with the other early birds, my co-workers, mostly anglos who can’t get work anywhere else. This is considered a good job, because it is. The supervisors are very nice, give us lots of leeway to make our own calls, and we work with beautiful product: high end tea. Nothing greasy or gross. Eight hours, I pack, I talk as I pack, I put things in boxes, take inventory, stand at a table and put tea in successive rounds of packaging to be shipped all across Canada. One half hour lunch break, and one fifteen minute break, and we are free at 4 p.m. I get home around 5 or 6, eleven or so hours after I left. It’s always nice to be home, to be able to do my own thing again, to relax, talk to friends, eat dinner, and watch TV. Tomorrow will be more of the same.